Comments: It was a recovery week after the marathon. It wasn’t pretty, but it’s now in the history books. The weather was fantastic. It was cool and sunny with little or no wind. It was excellent weather. I ran by myself which is a bit sad, but that’s just the way I am. This year I didn’t have a running buddy. Unofficially my time was 4:28 or about 10:14/M. So although my goal was 4:15 and I didn’t make it. But at least I was out there and trying to do the impossible. Bottom line, I did my best. There wasn’t anything left in the tank when I finished. As is my problem I was stiff as a zombie starting around mile 20+. As a result I got slower and slower. I had to walk for quite a while around miles 24 and 25. Near the end the 4:15 pace group leaders, and lots of friends passed and tried to encourage me to run, but there was nada, nothing left – all I could do was walk. 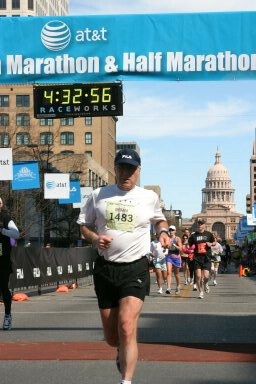 Only after the capital building did I begin again to shuffle along because I knew my family was waiting for me at the finish and I just couldn’t be seen walking then. So I hoofed it down Congress as best I could, but wasn’t pretty. I was stiff, stiff, stiff. What can I say. Last year was so fast at 3:50. Right now I doubt I’ll never get there again. So I’m happy to have completed my 5th marathon and finished it any way I could. 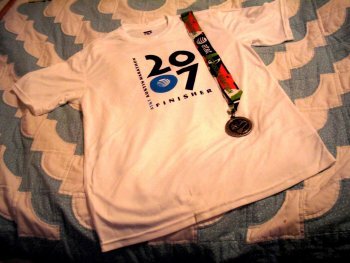 Oh and I’m very proud to have the finisher’s shirt and medal which are both cool. However the medal ain’t expensive bling-bling. No gold, silver or platinum or precious stones, but it is precious to me, because of the investment in sweat and time that I spent to get it. I’m proudly wearing them today for everyone to see. Update: Here is my heart rate. You see my heart rate drop after 4:00 because I was walking. Update: Here are my splits. The marathon is almost here. I’ve been visualizing the course based upon my turn-by-turn photos. In addition I’ve made a pace band PDF with a variable-pace adjusting for the hills (based upon a pace of 9:44/M with a 4:15 completion). Tonight I’ve got to get to bed early, because I won’t get much sleep tomorrow night. Right now we are in taper. The marathon is next week, and my typical jitters are beginning. 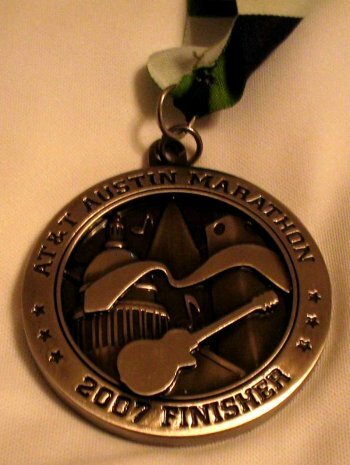 It is as if I hadn’t ever done a marathon before. Or that I’m worried about completing it. In any case we ran the first 7 miles of the marathon today for our long run. Although it was to be done slowly I just couldn’t. So I ran comfortably. I hope that I stayed at about MGP (marathon goal pace). However I think I ran faster than that. I finished in 1:18. This marathon is going to be a challenge with all the hills and pace changes. I need to create a custom pace band where each mile is a different pace depending upon the hills. As one of the new paid services provided by Rogue Training is a bus tour of the AT&T Marathon course. I had originally signed up for a later one, but John told me yesterday during the long run that he needed to switch and that was fine with me. We left at 12 noon and drove the entire course in air conditioned comfort. It was quite sunny and hot out. Steve Sisson, head of Rogue, and John Connelly, the race director, talked us though the entire course. It took two hours to make the tour. I made notes of each major hill and valley. This race will be a challenge. We ran the last 13.1 miles of the marathon course. We started at 7AM. I ran with John Z., Brenda, Joe, and Clarence. There are a few hills in the latter section, and the first five miles is a steady upward climb. So we tried to keep it to a slow pace, that is, less than MGP, and many times John, who was wearing a geek-o-meter, would say to slow down. Near the end Brenda, Joe and Clarence were a quarter mile ahead of John and I. I thanked John for being my running buddy for the day. It was nice to run with someone even though we didn’t talk that much. Just knowing he was there was good. We finished at 7th and Congress, then I cooled down back to the annex. It took me 2:16 to complete. John and the others went to breakfast, but I skipped it. At the annex I did my feet exercises, and then headed home by driving a few other runners to the start parking lot at Burnet and Northloop.